(MP3) (YouTube) 6:06 It's the second quarter of 2017! Time for a little website update and another track. 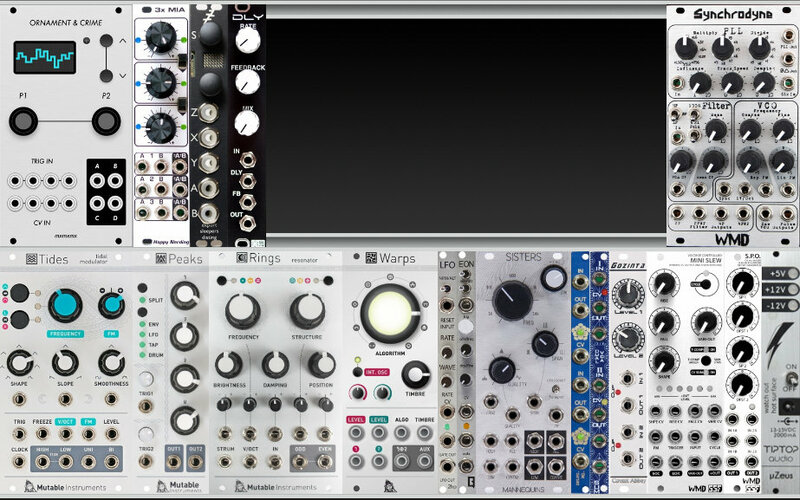 Here's what's in my current modular rack (ModularGrid screenshot here, not a sudden improvement in my photography). There's a Harvestman Kermit on its way (I believe it's named for the basketball player who nearly killed another player with one punch in a fight during a game, not the much more peaceful frog), and I also intend to get an EMW Arcade Noise. That's all I have planned for this rack right now; it's functionally complete and the collection phase is pretty much over. The basis of this rack has been exploration of new sonic territory. Having located a particular landmass I wish to explore further, I'm plotting a second, smaller rack that "officially" I'll begin setting up in 7-8 months (though the Kermit is destined for that one and there may be other migrations). Its theme is West Coast synthesis, with a digital and industrial edge. Voice 1A: Disting's FMable VCO, with Rings as the source. Rings' structure is sequenced separately from the pitch. Disting's saw output is lowpass filtered by Three Sisters and mixed with its sine output. O_C envelopes over VCAs for Rings I/O, the overall output, and Three Sisters frequency. MTransformer, Replika and ValhallaPlate VSTs. Voice 1B: Branching out from the above, this is just the Even output from Rings. Pitchproof, DubStation and Replika VSTs. Voice 2A: Microbrute through SpaceModulator VST. Voice 2B: Tides using 2A's pitch, with smoothness modulated by O_C looping envelope, into 0-Coast input. 0-Coast dynamics are controlled by Microbrute (but it's basically a drone anyway). 0-Coast is under a separate pitch sequence, and self-syncs its slope generator for extra character. It runs through a different instance of SpaceModulator. (MP3) (YouTube) 3:03 A spring breeze brings freshness and promise... and maybe change. Voice 1: Rings, modal mode. Rather than sequencing, pitches come from Tides, through Disting S&H and then O_C Quantermain. Triggers are sequenced, and since Tides is cyclic the interaction of two time scales creates a pattern. Rings brightness and FM offset are sequenced, structure modulated a tiny bit by Tides without the other processing, and RIngs Position modulated by a second Quantermain channel with different rules. Rings is in 4x polyphonic mode, so it alternates notes between its two outputs. One goes through Pitchproof, Dubstation and ValhallaRoom VSTs; the other MTransformer and DubStation. Voice 2: 0-Coast vs. Warps internal sine oscillator with bit mangling mode. 0-Coast slope generator cycles quickly and its EOC modulates the FM input, for the growly effect. Through Replika VST. Voice 3: Microbrute, with Synchrodyne's 2-pole output modulating its filter for some extra howling and wailing. TB Flx VST to stop it from getting out of hand, and space360 to place it behind the listener a bit. (MP3) (YouTube) 2:50 A couple of very different layered takes of a generative patch where a Rings output influences Synchrodyne's frequency, and Synchrodyne drives Rings' frequency in return. Since sudden changes in Rings' input frequency are interpreted as new notes to play, nothing else was required to generate triggers or provide modulation. The reverb is Rings' own in blinking red mode. (MP3) (YouTube) 2:05 I'm re-reading "Snow Crash" with its blend of skater punk, cyberpunk, and Babylonian mythology and I guess that's what inspired the punny name. There is definitely some noise here among the audible pixels, but the chances that it encodes the Nam-Shub of Asheara are pretty slim. I'm giving my new Kermit module a workout. At first I wasn't sure I was going to love it -- it behaves very differently from most things and definitely has a noisy digital vibe to it. It's kind of like a bag full of cotton balls and razor blades -- so softly fuzzy sometimes that you wonder where the reputation of this company now calling itself Industrial Music Electronics comes from. But then you find an edge, and it is sharp indeed. In this track we have digital and analog BZZZZ in roughly equal measures. The Kermit voice is both of its oscillators modulating each other, one with AM and one with wavetable morphing, no external modulation. Through DPLPG controlled by O_C envelope. Another O_C envelope shapes a trigger going into Disting in Precision Adder mode, giving the Kermit a twitch of higher octave at the start of each distinct note. A bit of Valhalla Plate VST. The 0-Coast voice has slope synced to its squarewave, with slope time modulated by an external LFO. This pumps pulses of varying widths out of the slope's EOC, which drives the Multiply circuit. No external oscillators needed, but there's some warbly detuned delay in SerumFX VST. 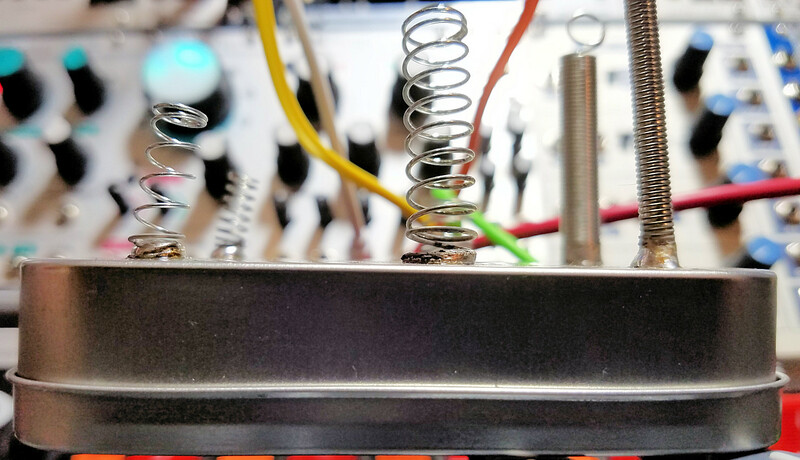 The Synchrodyne voice decouples the PLL from the VCO, instead syncing to 8th note triggers, with PLL damping stopping it from being static and sane. Sometimes it slips its leash and tries to do things I never told it to. It goes through Decimort VST whose filter is sequenced on a slower time scale. The last voice is my ByteBeater VST, completely unfiltered with a bit of ET-301 delay. It complements the Kermit to a surprising degree, I think. (MP3) (YouTube) 2:01 The name of this comes from a researcher's attempt to train a neural network with the names of varieties of fruit. Lots of good name possibilities in there, but some disturbing foods. I make a point of never eating "Brown Soften" apples, and "Pork Gala" sounds like it's probably Spam chunks and celery suspended in Jello. While it's 104bpm rather than 134, it is in 3/4 time so I figure that, by the Law of Fives, the given Klunk Number was still correct. This one consumed nearly all my patch cables again. But in fairness, I did weed out a few right-angle cables that get in the way in tight spaces. Voice 1: Microbrute, FMd by Kermit, through DubStation VST. Voice 2: Tides, FMd by Warps, through Three Sisters lowpass and DPLPG. Spirit Reverb VST. Voice 3: Synchrodyne 4-pole into Rings input, Rings back into SD input and out through VCA. Rings is in sympathetic strings mode and is FMd by Kermit. SD's resonance is controleld by Mini Slew envelope. Voice 4: 0-Coast, with its multiplier modulated by voice 1's Kermit channel through a VCA controlled by O_C envelope. Lots of self-AM going on in there. SerumFX and Valhalla Vintage Verb. (MP3) (YouTube) 2:41 Someone named "Bigsteak" on a forum asked about "West Coast style FM with Tides and Warps together with the waveshaper," so I thought, "why not?" I brought Tides back to factory firmware for this, which is something I was thinking about doing anyway for ease of tuning. 2hp LFO provides the clock; Kermit provides the shape of the melody-thing as well as envelope shape; O_C CopierMaschine quantizes it and serves it to Tides pitch and slope, and Warps pitch and fold amount. Tides is the modulator, Warps the carrier, DPLPG is the output stage and Valhalla Room is the reverb. Some manual wiggling of Kermit's waveshape. (MP3) (YouTube) 6:14 Not a 2-part drone, but a 4-part drone! Celebrating the new analog-to-SPDIF converter I finally added to open up two more inputs on my audio interface, and finally making use of the little mixer I've had for a while. Voice 1 is Kermit ch1 through Synchrodyne's 4-pole output. Kermit ch2 at LFO rate modulates ch1's waveshape and Synchrodyne's frequency. Voice 2 is just Kermit ch2, with amplitude modulation from ch1 making it audible. The LFO shape makes it thumpy; NI Transient Master makes it a little less so. Voice 3 is Tides FMing Warps, into Rings in sympathetic strings mode. A looping envelope modulates Tides' level, and its EOC triggers Rings' strum; a triggered envelope on a slower cycle raises Tides' pitch. Voice 4 is the three voices of Three Sisters self-oscillating. Span is modulated at audio rate by Mini Slew, which is itself modulated by the LFO that triggers voice 3's pitch envelope. Sisters goes into 0-Coast's input and its Multiply CV; 0-Coast's slope generator cycles at low audio rates and FMs its main oscillator. (MP3) (YouTube) 3:54 Sometimes I feel an elusive and surprising recognition when listening to my own work -- a sense that "that was a Starthief moment." I can't always pin down what it was, but here I suspect it's something about Tides' sound, the line it's playing and the harmony with other parts. The name seems quite Celtic but it's another one of those neural network fruit varieties. Surely some sort of apple from the Highlands, small and sweet but very tart, named wistfully after a lass the farmer was pining for. I wanted to call it "Planxty Moregall" but I'm not entirely sure what a Planxty is or why it's so galling. Voice 1: Kermit, with waveshape and VCA controlled by two Piqued envelopes. Voice 2: The other Kermit channel, with waveshape and VCA controlled by the other two Piqued envelopes. The output is multed to Mini Slew Cycle input, where it gets harmonically divided and mixed back in. Using Cycle instead of Trigger was a trick mentioned on a forum. Fault VST for some sample-reduced delay. Voice 3: Tides. Bi output is multed to Warps, where it is ring-modulated against the first Kermit channel. An envelope controls the level, and crossfades from Tides to Warps as the envelope level falls, increasing the noisiness of the sound's tail. Voice 4: 0-Coast. Triangle output runs through Synchrodyne, which is modulated by the 0-Coast's contour, and into the 0-Coast's input. Slope is synced to square and modulates Multiply. Univibe, SupaPhaser and ValhallaRoom VSTs. (MP3) (YouTube) 1:52 Sometimes you should just let machines be machines. Everything here was done with Kermit ch1 creating a rhythmic loop, modulating ch2. Ch2 output is multed to Mini Slew cycle input an another input (FM, shape, rise etc.) for harmonic division, which provides most of the melodic variation since I kept the Kermit freqeuncies constant in most cases. Sometimes Ch1 is also multed to a Mini Slew CV input. Ch2 output and Mini Slew Vari-Out or EOR are mixed. I repatched and tweaked a little to create some different loops. No effects other than Barricade. (MP3) (YouTube) 1:44 I got an EMW Arcade Noise yesterday, and spent a bunch of time squeezing a variety of drones, rumbles, chippy basslines and chaotic generative patches out of it. I recorded one of the latter and then didn't like my performance of it, so I repatched and wrote a little sequence and it started to sound a little bit like metal-ish guitar chugs. The Arcade Noise module is an 80s arcade-style noise generator (linear feedback shift register) -- think about shots and explosions in "Defender" as a classic example, though many early games had similar sound technology. Using one of these to make something like rock made me think of slightly later video games from my childhood, when Marble Madness and Reaktor had Yamaha YM2151 chips and played over-the-top fake guitar licks that I thought were the most incredible thing ever. That was the inspiration for adding a couple of FM patches to this. The first one imitates some of the other range of sounds the Arcade Noise can make, and the second is more clangy and wild than 80s games tended to employ. Voice 1a: FMetal, Bitsonic Recovery, Diode1 and WOW2 VSTs. Voice 1b: EMW Arcade Noise, with audio rate reset from EON squarewaves, Tap CV modulated by O_C envelope, through Sputnik QVCFA in LPG mode, and Gozinta for distortion. Voice 1a and 1b run together through Presswerk and ValhallaRoom. Voice 2: Warps sine osc and wavefolder, FMd by Tides, through another QVCFA LPG channel. Tides frequency and Warps fold amount modulated by clock-synced Kermit LFOs. Permut8 VST. Voice 3: 0-Coast with its square divided by Mini Slew, and Microbrute. Through MWaveFolder and ValhallaPlate VSTs. Another new toy -- not a Eurorack module though -- arrived yesterday. I will save its debut for another track. (MP3) (YouTube) 2:10 I'd like to propose... an apprenticeship phase between being merely an amateur toaster and a Toastmaster. This track seemed doubly toasty, in that several of the channels are pretty heavily toasted with distortion, and that one of my percussive sounds is not unlike tapping on a wine glass to get people's attention. Also it was 87 degrees today, despite being mid-April. Noise drums: EMW Arcade Noise through Sputnik QVCFA LPG. Incoming "pitch" CV switches between 2-tap and 4-tap mode and adjusts the speed of the clock rate envelope. More drums: Maschine Drumsynth Grit Kick, Fractal Percussion & Shaker. Attention please: Rings through Megaphone and +Decimate VSTs. Voice 1: Microbrute, heavy on the Brute Force knob, with Ultrasaw CV modulated by Kermit LFO, through my own ReBurn VST (a sort of hybrid distortion/reverb). Voice 2: Kermit through Synchrodyne. Zlob Dual VCA controlled by Tides envelope (I think this is the first time I've used Tides as a volume envelope in a recording; usually I have it doing less mundane things). Valhalla Plate & Space Modulator. (MP3) (YouTube) 6:12 "Gondola" is a fun word. So are "funicular", "defenestrate", "plectrum" and "impeach." "Timbre" is not a fun word. The correct pronunciation is just so grating. Voice 1: Kermit, AM'd by Arcade Noise, through Sputnik QVCFA LPG. Arcade's tap CV is modulated by random CVs from Disting (another shift register! ), and AN's output also modulates the time on an EON looping envelope. EON's gate clocks the Disting, and its envelope (gated by the sequencer) feeds Synthrotek DLY's input. DLY's output controls the LPG. Also the sequencer's gate boosts feedback on the DLY. That runs through ET-301 and Valhalla VintageVerb VSTs. Voice 2: 0-Coast with Kastle. They share a pitch CV; 0C's slope modulates Kastle's timbre (there's that word) and the Kastle's LFO flips its algorithm. Kastle output into 0C's audio and balance inputs. Through Valhalla Plate. (MP3) (YouTube) 2:14 I had this running for a while as I went off to another room to do some stuff, and when I came back I recorded it -- but I really just wanted to let it run forever and do its thing. Perhaps it's not the most amazing drone ever but I was into it, and it doesn't seem like it should have a beginning or an ending. Two minutes is probably too short, but ten was also too short, so what the heck. Arcade Noise with tap CV modulated by Kermit, and Kermit's other channel modulated by Arcade Noise. Both into Warps in bit mangling mode, with reverb and a Paulstretch layer and other stuff applied in the box. I'm approaching the limits of what Kermit's available waveshapes can do for me on their own as the main contour driving generative music. Combining them with each other or other sources, folding them, quantizing and holding them, and so forth will get me much further. (MP3) (YouTube) 1:51 What better way to celebrate Spring than with actual springs (and Rings?) Whether you're a human or a cat, making springs go "boing" is one of life's little joys. Crank Sturgeon Perpetual Spring Device, Xenytx Q502 mixer, Disting tape delay algorithm. Split to Rings and Mini Slew inputs. Mini Slew acts as envelope follower, modulating Rings position. Rings in Modal, monophonic mode. EQ and compression in the box, plus PSP PianoVerb on sub frequencies. Recorded in one take. (MP3) (YouTube) 2:23 This one goes up to 11... 11/4 time, anyway. I like odd time signatures but I don't usually go that far. Voice 1: 0-Coast, FM'd by Kermit, with the balance turned very close to full triangle. The bass on this thing is momentous. Valhalla UberMod VST. Voice 2: ArcSyn, which is one of my favorite VST synths for sound design, with Valhalla Vintage Verb. Voice 3: Rings in inharmonic string mode, through Sputnik QVCFA in VCA mode for once. Its input is Arcade Noise through Sputnik QVCFA in filter mode. Tides modulates Arcade Noise clock rate and Rings structure. Output paralleled with Three Sisters in formant mode, with modulation from the other Kermit channel. Valhalla Plate VST. With the arrival of blank panels yesterday, the last gap is closed and I'm "freezing" my modular system -- no new stuff until Knobcon in September. Seems like a good time for another photo. (MP3) (YouTube) 3:57 In case you're seeing this on YouTube: no, this contains no stock footage, that's just the name of the song. I can't explain why other than I liked the phrase, and when you make as much music as I do you tend to accept reasons like that. It's either that or "Expedition, Part LXXXIII" and frankly trying to read Super Bowl numbers and copyright dates done in this pretentious way is annoying enough. Besides, screw the Roman Empire anyway. What did they ever do for Western civilization? And if you're seeing this on my website in MP3 form, well, it's still the name of the song and I've just complicated things. Voice 1: the hum from my desk fan, picked up by Perpetual Spring Device, through Valhalla Room. This started as an accident but I liked it. Voice 2a: Kermit ch1 through Rings in sympathetic string mode, with frequency set very low to act as a delay. Voice 2b: Rings output is multed to Kermit ch2's AM input, and to Mini Slew as envelope follower to control the LPG ch2 runs through. Voice 3: Tides, mixed into the same input (and reverb) as the fan hum. Smoothness and level modulated by O_C envelopes. Voice 4: Microbrute with its highpass filter set to high resonance and Brute Factor. Depending on what compression and your sound reproduction equipment do to the signal, and your own high frequency hearing, this may be pretty annoying or completely unnoticeable. It sounded pretty nifty to me though, and I hate excessive shrill stuff in glitchy and noisy music. Voice 5: PlastiCZ VST through Vandelay. (MP3) (YouTube) 3:15 And now for something at least a little different. Some Transient Master and SerumFX on the master channel. That's right, no modular this time, just unapologetic digital weirdness from the new kid. I think the sound engine has a lot of potential, the features left out of the early bird version (to be completed later) are pretty important synth staples, and the interface needs to be buried at a crossroads. But that sound engine would have made a nice, crazy modular oscillator that would feel at home between Harvestman and Beast-Tek gear. It doesn't *have* to be harsh and weird, but the sweet spots are tiny archipelagoes in a vast sea of Z*XCYVIUWE#GFIWUGSZTXDXPXMXDSX. It's a busy animal for sure -- the first 30 seconds of this track are a single instance. The rhythm and bassline mostly comes from slowing the rate at which it cycles through its sub-oscillators, which normally happens at audio rates. I set the song tempo to match that rate and started writing. The variation from one bar to the next comes from modulating a single parameter. I look forward to the updates in the finished version, but I still figure this will make drones and noise for me. I'd like to try using it as a (generally less harsh) complex oscillator, and feeding it into an LPG in my modular -- I bet it'll shine for that task. Radical... tubular... gnarly. Buchla didn't use tubes in his synths, but he was kind of radical in his art, and "gnarly" really is a fine word to describe the sound of analog FM, wavefolding and LPGs and mild to severe disdain of Western musical dogma that defines the form. As this track developed, I found myself wanting to get away from the "vactrol bongo" (or bonk, as I think of it) sound a bit. I've been leaning on it quite a lot lately. So I used a slower attack time with a sine shape on voice 2a and added the extra layers of 2b and 2c, and combined two envelopes in voice 3. Voice 0: Field recordings of an automated checkout lane made by sticking a pair of earbuds into the Mic port of a Rio Carbon MP3 player. (Yeah, that was a while ago.) A whole bunch of them are played simultaneously in a cluster, with distortion and filtering in Waldorf D-Pole, tremolo in ShaperBox, and Valhalla Room until it's a chorus of ghostly whispers. Voice 1a/b: Two instances of Waverazor, one of which is a plain sine, the other of which takes 1/4 of the sine and plays it at the wrong frequency to turn it into an inharmonic drone. Through the same tremolo/reverb used for voice 0. Voice 2a: Kermit ch2 through Synchrodyne, through Three Sisters bandpass, through Sputnik VCA. Synchrodyne's sawtooth output modulates Sisters FM. Voice 2b: Kermit ch1 through Sputnik VCA; envelope is set to 2 in 7 Euclidean pattern. Voice 2c: Kermit ch1, but through Mini Slew as a divider, and Sputnik LPG (same envelope as 2b). These three play in unison. An effects send runs through DubStation, dBlue Clipper, ValhallaRoom and Maul; the send and the mix both go through Valhalla Vintage Verb. Voice 3a: 0-Coast, using Slope for the Multiply CV and mixing Slope + Contour for dynamics control. Voice 3b: another Waverazor instance into 0-Coast input -- notes are sequenced separately but 0C controls the dynamics. Both into DubStation for a faster delay and Echobode for a slower, more diffuse delay. (MP3) (YouTube) 2:03 The title is a notification I frequently see from my weather app, but it often strikes me as some kind of statement about life, nature, politics or whatever; it's definitely open to interpretation. Pretty happy with this one overall. I feel like I accidentally made it rock. voice 1: 0-Coast & Synchrodyne. Same pitch sequence; SD 4-pole output into 0C audio input and SD saw output to 0C linear FM. 0C contour controls balance. FX send with Replika VST through ShaperBox tremolo. Drums: Maschine Harsh Kit through Permut8 and Megaphone. Voice 2: Microbrute FMd by Kermit. Voice 3: Waverazor through Spirit Reverb. (MP3) (YouTube) 3:17 I woke up in the middle of the night and started this, and managed to finish the song but not the post-processing and uploading until after I'd gone back to bed. No other story behind it, really. Voice 1: Rings through Microbrute. Rings is in inharmonic string mode and 4x polyphony, and damping is set long so each "note" the Microbrute articulates contains the four most recent frequencies played. With some overdrive and resonant filtering, it gets pretty clangorous. MWaveFolder, Ratshack Reverb and ET-301 delay VSTs. Voice 2: Warps FMing Tides, which is the "wrong" way to do it. One envelope modulates Warps wavefolding, another Tides' slope, and a third Tides' smoothness and a Sputnik VCA. Malefica and Guitar Rig 5 VSTs; Guitar Rig is running Fast Comp, Pitch Pedal +1 octave, LIttle Reflektor and Stereo Tune. Voice 3: Clangs from Arcsyn using three FM voices, through Ratshack Reverb and ET-301. Kick drum: 0-Coast, with its square wave running through Three Sisters modulated by a Kermit channel. DubStation VST. Claps: Noise from Disting's S+H mode, through Sputnik VCA and Synchrodyne 2-pole lowpass. Mini Slew provides the envelope for the VCA and Synchrodyne's PLL influence. Hi-hats: Waverazor through Valhalla Plate. (MP3) (YouTube) 2:33 As I was working on this I suddenly thought of Pachelbel's Canon. I guess there are sort of some similarities. No offense, Johann. Voice 1: Synchrodyne through Sputnik VCA, stacked with Kermit ch1 through Sputnik VCF. Kermit is AM'd by Arcade Noise. Voice 2: Microbrute with filter FM from Kermit ch2. Through WOW2, Valhalla Room, and two serial instances of ShaperBox to create a psuedo-multitap delay. Voice 3: Two instances of FM8 with just slightly different settings, panned left and right. The crackling is due to modulation envelopes within the patch, not a separate effect. Voice 4: Plogue Chipsounds, SerumFX and another two instances of ShaperBox for the same trick. Voice 6: 0-Coast FMd by Three Sisters in formant mode; Valhalla Plate. (MP3) (YouTube) 2:19 Is this acid jazz? I am never really sure. The name was one of those things I saw on a license plate, though of course with numbers in it, that sounded like it should be a word. Maybe it's a cute little side table from IKEA, or a kind of pastry, or a Danish word, pronounced nothing like an English speaker would guess, referring to a particular emotion that only Danish people are capable of having. Voice 1: People have been talking about how Kermit and Tides are best buddies, so I started this track with Tides FMing Kermit, through Disting's linear-to-exponential algorithm. Kermit output goes to Sputnik LPG and VCF, one of which is selected by O&C's Euclidean sequencing in Piqued. Shaperbox and Frosting give it the glitchy treatment. Voice 2: Arturia Analog Lab 2's "8bit Synth" SEM preset, with minor tweaks and Transient Master. Voice 3: 0-Coast and Synchrodyne (one of my own picks for partners in crime, though 0C makes friends easily). 0C's square output to SD's sync; 4-pole folded output into 0C audio input. Voice 4: The piano-esque chords are Rings in 4x polyphonic, Western Chords mode with input from Kermit at a fixed frequency, position modulated by Arcade Noise, structure by an EON envelope, damping by 2hp LFO. Through DPLPG modulated by Mini Slew envelope, and Replika VST. Voice 5: The hi-hats that morph into squeaks are Microbrute. (MP3) (YouTube) 2:26 This started as an experiment with two VCOs into Mini Slew, which can bear all kinds of fruit, some sweet and some bitter and some probably poisonous. The name comes from the always amusing, sometimes useful for naming crazy music, lewisandquark.tumblr.com blog about trying to train hapless neural networks in cooking and language. I feel like the robot revolution is either quite a ways off, or else it will be truly bizarre and frightening. I volunteer to provide their soundtrack, though. Sorry, human friends, I know which side of my bread is buttered. Or given their recipes, which side of the boneless head ham bananas is oozing with spore sauce. Voice 1: Synchrodyne's pulse output into Mini Slew trigger, and Kermit into Mini Slew input. Rise CV is envelope modulated. Output is clipped in Gozinta, and runs through Zlob Dual VCA. Clipping level and Kermit waveshape are hand-tweaked during the recording. Voice 2: Rings in modal mode, FMing Warps sine oscillator through Chebyshev waveshaper. Tides LFO modulates Rings FM. Envelope modulates Sputnik VCAs for Rings level and Warps output. Transient Master and Echobode VSTs. ...or maybe I play with sounds and then when things start to sound cool, I go with the flow and make connections on the way. It's still art. Voice 1: 0-Coast, FMd by both Kermit channels mixed. Contour and Slope both control dynamics, and Slope also modulates Multiply. SerumFX VST. Voice 2a: FM8 VST pads. Voice 2b: Korg PolySix VST pads. Both through ValhallaRoom. Voice 3: Synchrodyne, with PLL influence modulated by O_C envelope. Fed to Warps FM input and Warps channel 2; crossfaded by another O_C envelope, and through Sputnik LPG modulated by a third envelope. Voice 4: "grandfather clock" percussion is a trigger into Three Sisters All input, LPG output into FM, All output through ValhallaRoom. Higher snaps and pops are from a second gate modulating Sisters frequency. Voice 5: Rings in Modal mode, FMd by EON, position modulated by Arcade Noise, through Sputnik LPG. Dubstation and ET-301 delay VSTs. (MP3) (YouTube) 6:58 We had a long, slow drive in the rain to go to dinner tonight, and I found myself wishing it less of a dreary slog and more of a contemplative hour. My music is something I have much more control of than traffic or the weather, so here are a few moments of no-coast-ish, semi-atonal ambient. This was another name from my favorite neural network blog, but if you want to imagine the internet-famous Japanese cat curling up into a cozy cardboard box on a rainy day, please be my guest. Voice 1: 0-Coast, with its square oscillator through Warps Parasite tape delay and back into 0C input. Tape speed modulated by 2hp LFO. Slope triggered by slow clock, controlling Balance and Multiply. Permut8 and ValhallaPlate VSTs. Voice 2: Tides into Rings input. Tides FM modulated by Euclidean pattern envelope, Smoothness by another envelope, Slope by Kermit. Rings in 4x polyphonic sympathetic strings mode, FMd by white noise, Position modulated by Kermit. Stereo outputs through Sputnik LPGs, and UberMod, Fault, WOW2, & Replika VSTs. Voice 3: Arcade Noise clocked by EON square VCO, through Sputnik LPG modulated by a rapid Mini Slew cycle gated by the note gate. Arcade Noise tap CV is modulated by Kermit. Through Valhalla Plate, and stacked with ByteBeater VST. (MP3) (YouTube) 2:40 This was a troublesome song. I came up with a neat, almost FM-like patch and then while exploring that space, lost the quality of sound that originally struck me as particularly cool. But I used what I had, made it into a song and tweaked again, never really recovering the first discovery but getting something kind of neat. 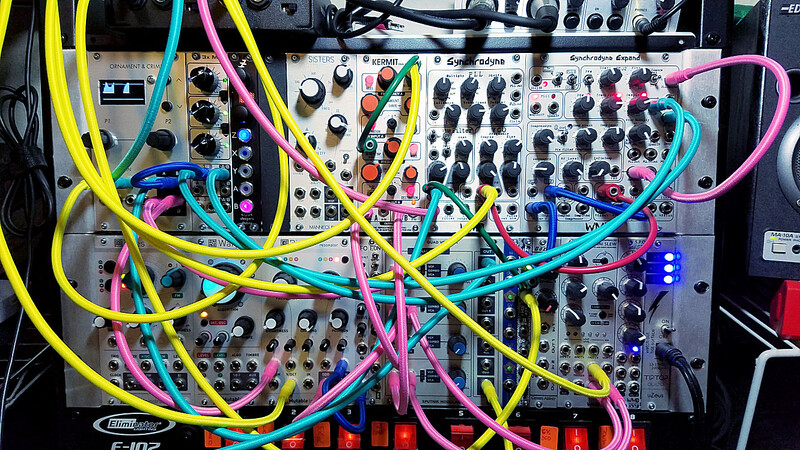 Modular synths don't have a "save" button or an "undo." (Okay, some digital modules do save their state in case of powering off, and a very few have ways to save and recall multiple groups of settings. But I'm talking about overall.) When exploring sounds, I feel like stopping to take photos or notes would slow me down. But the few times I hit something like this, I wish I had. Maybe I should video everything just for moments like this. Once I was "done" with the song, I realized I'd recreated way too many aspects of a favorite song someone else released commercially. Frustrating, because I rail against people who assume that all independent electronic music, or all music created by "amateurs", or all music created on modular synths, is the same. So it had to go. After dinner I reworked the melody, messed with the patch again and retuned stuff in the process, and redid the harmony to fix the new melody and tuning. And here it is -- something I'm not very proud of at this moment but I'm following my unwritten "publish and move on" rule. It's rare that songs I feel this way about become favorites later, but sometimes I mellow toward them and enjoy them a little at least. This one came real close to getting deleted, so I hope it repays me with some enjoyment later on. I still kind of hate it right now and I had to stop myself from attaching a photo of a dumpster fire for the YouTube version. Voice 1: A HumBuzz sample from Detunized, through Valhalla Room. Drums: "Gem" Maschine kit with Transient Master and Decimort2 VSTs added. Voice 4: Arcade Noise, reset by EON squarewaves with clock modulated by Kermit, Tap by Tides, and 4/2 taps switched by 2hp LFO. Through Three Sisters bandpass and Sputnik LPG. TB Equalizer and Dubstation VSTs. (MP3) (YouTube) 1:44 The title for this track was on my lips after waking on April 24, 2010 and posted it on Facebook. I remembered nothing of the dream, but it must have been either glorious or truly terrible. It all depends on whether it was really a spa or some kind of brainwashing facility, and what the bacon is being replaced with. Voice 1: Kermit ch2, AM'd by ch1. Through Sputnik LPG into Warps wavefolder (very different from wavefolding before the LPG as in the 0-Coast and most West Coast complex oscillator setups); fold amount controlled by EON envelope. Three Sisters modulated by a very slow Mini Slew envelope (TIL how awkward it is to set long but precise envelope times in Mini Slew.) A touch of Speaker VST. Drums: Maschine Abbey Road 70s Tight Vintage Kit with a few changes and effects. Voice 2: PPG Wave 2V through Presswerk and Decimort2 VSTs. Voice 3: Tides through Three Sisters, Zlob Dual VCA, and diode1 VST. Tides self-modulates its shape, and Synchrodyne (syncing to Tides) its smoothness. (MP3) (YouTube) 5:45 Not a latin name of a poisonous plant, exotic cocktail or Norwegian black metal band -- just another neural network generated name, ostensibly for a car model. I like how this came out. When in doubt, make dark ambient. Voice 1A: Trigger into Syncrodyne In; frequency is fixed. 2-pole folded output modulates its PLL influence; 4-pole output into LPG pinged by same trigger. Voice 1B: Trigger toggles Mini Slew cycle. FM from Synchrodyne sawtooth output. Both through Permut8 (as Karplus-String resonator), Valhalla Plate, another Permut8 (as glitchy delay), and Echobode (more delay/diffusion). Voice 2: Arcade Noise with/through 0-Coast. Fixed frequencies; AN feedback tap modulated by 0C contour and Slope used as an extra oscillator. Valhalla Plate VST. Voice 3: Tides into Rings, Sputnik LPG, Warps wavefolder. Rings is in modal mode, 2x polyphony. Tides Uni supplies Rings input, Bi the FM, and High Tide self-modulates Slope. Rings Damping and Tides level are gated. EON envlope pings Sputnik LPG, but with a big bias. Fold amount is a separately sequenced gate. Voice 4: Kermit ch1, AM'd by Kermit ch2 at a fixed but high frequency. Through Three Sisters center band, with frequency controlled by O_C envelope. Permut8 (clicky delay), Valhalla Plate, and Transient Master (to remove some of the click) VSTs. (MP3) (YouTube) 2:19 This track was born from playing with synthesized kick drums, and trying to decide whether I want to keep Kermit in the long run or replace it with something a little less idiosyncratic. (I think the answer is probably no.) I was also probably influenced by listening to a Mono No Aware album yesterday, which I would describe as rhythmic noise more in a noise vein than the simpler "crank it up REALLY LOUD and turn everything into square waves" behind a lot of the genre. Because of all the random chance inherent in how the track was made, I recorded it twice and mixed the two takes. Voice 1: Kermit through Three Sisters highpass, multed to two Gozinta channels at different overdrive settings, crossfaded in Warps. A quick decay envelope into ch1 pitch gives the classic electronic kick drum sound, while the waveshape is modulated by clock-synced channel 2. There is no VCA or LPG to cut off Kermit when the kick isn't playing, so the noise caused by ch1 at sub-audio rate frequency while having its shape mangled by ch2 creates noises in between. Note pitch sequences control the crossfade between slightly overdriven and drastically overdriven signals. A noise gate VST has its threshhold sequenced to let different levels of noise (and sometimes none) through. Valhalla Room is applied to just the bass range, and Decimort2 and MTransformer applied to higher ranges. Other percussion: Maschine Drumsynth Kettle and Cymbal, each highly processed. Voice 2: Rings in sympathetic strings mode, fed another fast pitch envelope for a different sort of zappy kick drum. But damping is relatively high and 4x polyphony is engaged, and sometimes odd things happen and some of Rings' voices get stuck along the way and play a random note. MWaveFolder and SerumFX VSTs. Voice 3: Arcade Noise through Synchrodyne, into the CV input of DPLPG. Gate into the input, which is backwards so it gives a different sort of half-wave rectified but vactrol-blurred sound. One clock pokes at Arcade Noise's feedback tap, and another triggers envelopes that FM Synchrodynes' frequency; Synchrodyne saw output modulates Arcade Noise clock rate. Valhalla Plate VST sandwiched between severe noise gates, and then Echobode. Voice 4a: Microbrute with a "backwards" envelope (very short decay, longer release, so shorter sequenced notes ring out longer). Chipcrusher VST. Voice 4b: Microbrute's envelope also controls a Sputnik LPG, through which Tides is fed at a constant frequency. Tides smoothness is modulated by Three Sisters all output just for extra grit. (MP3) (YouTube) 4:30 This track is about twice as long as the previous and took about 1/10 as much time and effort to put together. Just how it goes, sometimes. There's some cross-modulation between Kermit channels, and Echobode and ValhallaPlate VSTs. I tweaked modulation amounts (using 3x MIA, which was very handy) and connected/disconnected sources during the recording. (MP3) (YouTube) 2:49 "Hold Mouse" was a fantasy RPG spell (presumably a level 0 cantrip?) invented by the neural network that's provided so many other great names. Alternately, it's the instructions I once had to give new computer users who didn't understand that letting go of the mouse and trying to stab it with an aerial finger assault, skidding it across the table, was not the most effective technique. This was back in the days when most peoples' interactions with computers were done very gingerly and usually in the company of a confident, if exasperated "wizard." Voice 1: Disting Mode 4C VCO, FM'd by triple sine from Three Sisters. FM index mediated by Sputnik LPG from O_C envelope. The Disting's sine and saw outputs are mixed in Warps in wavefolder mode, with an LFO gently affecting the fold amount; output through another Sputnik LPG channel. Through Permut8, ET-301, Echobode and ValhallaRoom VSTs. Voice 2: Pads from Waverazor VST through Permut8. Voice 3: 0-Coast, with balance modulated by soft Kermit noise, and FM just barely feathered by Arcade Noise. Dynamics brightness decreases somewhat with higher note frequencies. Syntorus VST. Voice 4: Kontakt Kinetic Treats Electric Train Set/Drive Wheel 2, and noise FX from The Giant. (MP3) (YouTube) 6:06 I had planned to come home from work, get two of the three chores on my list done first, and *then* work on music. Instead I kind of interleaved getting stuff done and making two tracks while resting. But the main thing is I got stuff done. Just a simple, spooky dark ambient drone. OooOOoOOoOoo. Voice 1: Kermit ch2 (amplitude modulated by ch1) feeding Rings in inharmonic strings w/reverb mode; FM from Tides Uni output. Voice 2: Tides with slope modulated by same Kermit ch2 signal; Bi output to ValhallaUberMod VST. (MP3) (YouTube) 4:21 Here's my 100th track for 2017, and we're just 35% of the way through the year. This time last year I had 29 tracks done, and it wasn't until November 16 that I set myself a goal of finishing 100 tracks. (Which I did, and then 20 more.) So I expect I'll end the year with close to 300 tracks done, though I have no particular goal this time. Enough metrics. Here's a very busy and noisy two-part semi-drone. I'm naming it after one of the city-states in Sean McMullen's Greatwinter Trilogy, because it reminds me very much of the sound of small prop engines -- perhaps young Wardens in training at an airfield, and guildsmen carefully tuning centuries-old engines whose names are better known than their own. Voice 1: Tides into Rings, with Kermit and 2hp LFO modulation. Tides/Rings pitch controlled by a switch on 3x MIA to add offsets together (I should probably get a small manual switch since that was awkward, or y'know, just use a keyboard). Tides level (and thus overall volume) controlled by the other 3xMIA channel. Tides Uni self-modulates slope through Kermit ch1-controlled VCA. Tides FM modulated by Kermit ch2 (whose shape is modulated by ch1). Tides smoothness modulated by 2hp LFO. Tides Bi output to Rings input; Tides low output through Disting HPF into Rings FM. Rings in sympathetic strings mode. Valhalla Vintage Verb VST. Voice 2: Synchrodyne, Three Sisters, and Warps with EON modulation. SD self-oscillating, 4-pole output into Warps channel 1; SD saw output into Sisters all input; Sisters all output into Warps ch2. EON cycling envelope modulates Sisters Q. Warps is partway between bit-mangling and comparator modes with Timbre about halfway up. Through Xenyx mixer to control level and fade between two VST effects chains. chain B: Echobode (with a frequency shift and diffusion), CamelCrusher and Replika. (MP3) (YouTube) 3:39 It's about the stages of life, or entropy or the transitory nature of things, or maybe I just wanted to pick a name that is a bit what this sounds like. Artist's statement, whoo! Voice 1: 0-Coast FM'd by Synchrodyne's sawtooth output. Slope section is synced to square with a slow rise time, and modulates Multiply as well as feeding EOC pulses into the mix. Dubstation VST sandwiched between two instances of Permut8. Voice 2: ByteBeater VST through Coder (a screwy distortion plugin I wrote based on intentionally wrong PWM encoding) and Permut8. Voice 3: another ByteBeater instance, through WOW2. Voice 4: both Kermit channels, mixed and FMing Warps, through Sputnik LPG. Permut8, ET-301 and Valhalla Plate. Voice 5: Microbrute with 2hp LFO modulating its filter since its own doesn't go slow enough. (MP3) (YouTube) 3:34 Recently I was describing "Tour of the Universe," a science fiction art book from 1980 that seems to have borrowed a little from the Twilight Zone's "The Odyssey of Flight 33" (accidental time travel) and naturally some influence from Star Wars. In turn, it seems to have inspired other tales and visuals, including The Fifth Element (multipass; a couple who wins a galactic cruise on a faster-than-light luxury liner but which was set up by the government because one of them is their agent). There were also two forum threads I can credit for bits of this. One was asking for examples of Rings and Warps together; I have a few but not as many as I'd guessed. The other was a thread about the silliest sounding modules... so I figured one fairly silly, but still kind of cool sound would have a place here -- thanks, Microbrute! Also, I just picked up EchoMelt VST and expect it'll be a regular pick, much like Echobode, Replika and the Valhalla bunch. Voice 1: 0-Coast + Tides. 0C Slope modulates Tides slope (fair enough); 2hp LFO slightly modulates the balance between 0C's oscillator and Tides. EchoMelt VST. Voice 2: Rings (modal, mono) into Warps (ringmod vs. triangle osc, but Disting envelope follower brings it to wavefolder moemntarily). Eos 2 and EchoMelt VSTs. Drums: HS Analog Tempest "GrainCodes" samples. Voice 3: Microbrute, whose bandpass filter is at high resonance and Brute factor for almost a hardsync sound. Echomelt and Valhalla Room. Voice 4: FMetal VST (often but not always in unison with Microbrute). Voice 5: Modelonia VST with Permut8 (whenever it plays, it's in unison with the Rings voice). (MP3) (YouTube) 1:13 Feeling a bit under the weather, I declined to go to a show tonight called "Analog Revenge." Instead I made this track, which is as analog as I get. Still sequenced by a computer, MIDI to CV through digital circuitry, converted back to digital audio to be recorded by the computer, given some minor DSP treatment (compression, EQ, and a touch of the analog-like Ratshack Reverb) and saved and distributed in digital formats, of course. But all the oscillators, filters, articulation and modulation are fully analog. As I've said before, I think analog circuits have their place and so does digital hardware and software. I care about sound, workflow and fun than what's behind the panel (and indeed with a couple of modules I'm really not sure how to classify them). But this was a fun bit of challenge since it imposed some limits I had to work around. Voice 1: Microbrute. Mini Slew modulates its Ultrasaw at audio rates; gate output triggers one DPLPG channel which controls the other, for a slower vactrol decay. Voice 2: 0-Coast. Its square output is run through Three Sisters All input, in formant mode with max Q, and back into the 0C's audio in. Span is modulated by the 0C's slope, which is modulated by its Contour. Contour also modulates Overtones and Slope modulates Multiply. Voice 3: Synchrodyne through Sputnik QCFA in VCF mode. (MP3) (YouTube) 2:56 Okapis are neat. Coffee is neat (sometimes). Playing with words is neat. That's the whole story here. Voice 1a: EON (oscillator mode) through Sputnik QVCFA in VCF mode, just plucked with triggers. Diode VST. Voice 1b: Rings in inharmonic string, duophonic mode. Input is Arcade Noise synced to EON. Position controlled by velocity, brightness by envelope. Both outputs into Warps, partway between wavefolder and ring modulation algorithms but with the algorithm under envelope control. Through Sputnik VCA. EchoMelt VST. Drums: Goldbaby Valve SK1 Drums, with some edits. Voice 2a: 0-Coast, with balance modulated by Kermit ch2 synced LFO, whose waveshape is modulated by Kermit ch1 at audio rate. Voice 2b: Kermit ch1 through DPLPG, triggered by inverting and offseting the 0-Coast slope EOC. MTransformer VST. Voice 3: Synplant VST with Replika, with sequenced synced delay time. Voice 4: Tides. Slope modulated by Microbrute LFO; smoothness from Mini Slew envelope, through Mini Slew's VCA and Three Sisters all input. Sisters modulated by 2hp LFO. Ratshack Reverb VST. (MP3) (YouTube) 5:36 I wasn't quite sure what I wanted to do here. I had some lo-fi cellphone recordings, and I also thought about making a track with nothing but no-input effects that have their own noise floor and glitches, and I also thought about just recording LFOs and other gentle "accidental" noises from the modular. So this time, I just did all three. It also amused me to have Kermit alongside a recording of frogs, even though the module is named after Kermit Washington rather than America's favorite green guy. Summer (and Spring when it's pretending to be Summer) is my least favorite season, but some things about summer nights are enjoyable. If it's not too hot and humid, anyway. If you can just step out onto the deck, listen to frogs and rain for a while, and then nip back inside into the air conditioning. Voice 1: Cellphone recording of frogs and air conditioner noise in our backyard. Played back with Crank Sturgeon Perpetual Spring Device sitting on top, recorded into Maschine. Slowed down, lowpass filtered and played through Permut8 VST. Voice 2: Kermit in LFO mode, with waveshape modulated by the other Kermit channel in LFO mode. Transient Master to reduce clicks somewhat, and Valhalla Plate. Voice 3: Cellphone recording of rain outside my office, played back through Perpetual Spring Device. Highpass filtered and run through Permut8 and Transient Master. Voice 4: Two instances of Permut8 in series plus Eos 2. No input, just amplified errors/feedback in the plugins. Voice 5: Rings in Karplusverb mode, frequency dropped way down, but V/oct modulated by Synchrodyne phase delta output. Structure modulated by Tides cycle, position by Synchrodyne saw output. Odd output into Arcade Noise tap CV; Arcade Noise output to Synchrodyne frequency. Even output monitored, through Space360 VST. Basically just generating another kind of noise/hum. (MP3) (YouTube) 2:00 No dogs were harmed during the creation of this track. They were pretty aloof about the whole thing. Voice 1: Warps sine oscillator, with envelope-controlled DC offset and feedback through Disting full-wave rectifier. (There are many ways to patch this, and I'm going to remain a little vague in hopes that I discover a niftier version next time.) Through Sputnik LPG. Voice 3: Kermit ch2, with shape modulated by ch1 in tap LFO mode. Through Mini Slew envelope/VCA. Drums: Maschine Liebing Classic Kit. All parts including drums are through Permut8 (which is creating the vaguely saxophone-like climbing sequence, particularly notable when just Kermit and drums are playing) as well as Echomelt and the usual compression/limiting. Voice 1: Tides, with slope and level modulated by envelope, plus Kermit ch2 throguh Sputnik VCA, mixed in Disting full-wave rectifier. EchoMelt, Sandman Pro and Maul VSTs. Voice 2: Rings in Modal, 4x polyphonic mode, with Brightness modulated by envelope, AM'd by Kermit ch1 in Zlob Dual VCA, through Mini Slew envelope/VCA. Valhalla Vintage Verb VST. Voice 3: Korg Legacy Wavestation VST, Vapor & Valhalla Plate. (MP3) (YouTube) 2:40 There was a lot of chaos and pain today for friend and foe alike. It seemed to call for a somewhat morose song, but one where there's a hint that good things might emerge eventually. The difficult-to-spell name was generated by my favorite neural network name blog post so far. Just be glad I didn't choose "Rose Hork," "Dorkwood" or "Stanky Bean." Voice 1: Kermit ch1 through Three Sisters, which is FMd by Kermit ch2 controlled by EON envelope. LPF and HPF outputs through Sputnik LPGs (HPF is attenuated and uses a gate signal for CV; LPF is direct and uses DPLPG to produce a slower attack and decay for its CV). Through Zlob Dual VCA for sequenced volume level. Valhalla Vintage Verb. Voice 2: Lord of the Springs VST, through EchoMelt and SerumFX. Voice 3: Microbrute with high filter resonance, and cutoff modulated by Mini Slew envelope. Ubermod, SpaceModulator and Echobode VSTs. (MP3) (YouTube) 5:51 I made this with 2/3 of Three Sisters plus Synchrodyne. The "sink" pun came to mind, which immediately made me think of the widespread Europrean murder ballad where a jealous girl (or a conspiracy of two) drowns a younger sister who is luckier in love. A musician comes along later, finds the corpse and does what comes naturally: makes a musical instrument out of the corpse. The instrument has a sweet and heart-rending tone but only plays one song: the tale of the murder. The instrument is usually a harp or a fiddle, never a modular synthesizer. I hope this doesn't give Martin Howse any ideas. (He sold modules that literally contained graveyard dirt in glass coffins, and also modules with nuggets of uraninite and a Geiger counter. I wouldn't put actual bones and hair past him). The patch: Three Sisters High output to Synchrodyne filter in; Sisters Center output to Synchrodyne PLL influence. Through Sputnik LPG, controlled by 3x MIA just for fadein/fadeout. UberMod VST. Synchrodyne PLL Influence, PLL Track Speed, and PLL Damper, and Sisters Crossover/Formant switch, manually played during recording. (MP3) (YouTube) 2:18 When I recorded this, the file saved in a folder called "yeti fur samples." I was almost convinced to change the name. Drums: Goldbaby 808 SP1200 samples, into Disting envelope follower and Mini Slew input. Mini Slew is FMd by Disting envelope follower and output is recorded. More drums, snare-ish thing: EMW Arcade Noise with 2/4 tap CV modulated by Kermit, through Sputnik LPG and ValhallaPlate VST. More drums, scratchy thing: Tides modulating Warps saw oscillator frequency, through Sputnik VCA. Voice 1: Rings FMd by Kermit. Voice 2: 0-Coast and Synchrodyne. 0C square out to SD sync; 0C slope to 0C exponential FM. SD 2-pole output mixed with 0C triangle, into 0C audio input, blended with 0c's shaped sound. 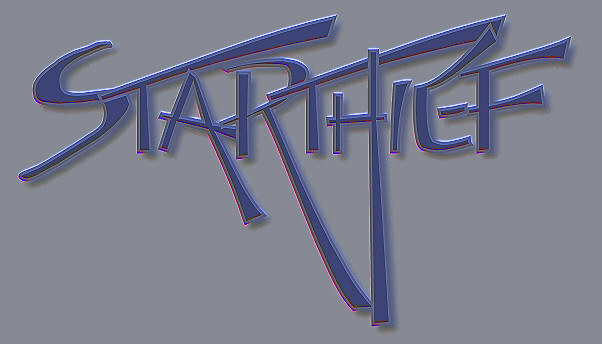 Through Syntorus VST. (MP3) (YouTube) 6:41 I've been experimenting with the Synchrodyne (oscillator/PLL/filter/complete voice and general mayhem device), and researching its (completely over-the-top bonkers awesome) expander. As a result I'm shuffling my expansion plan again, and that expander is high on the priority list. I've also been trying, more and more, a combination of sequencing and manual playing of controls. For this one I created a 16-bar looped sequence, while manually playing with filters, levels, and shapes. Voice 1: Kermit ch1 using Synchrodyne as a sort of bandpass gate. (Mini Slew envelope controlling SD filter frequency and VCA; envelope fall time modulated by Kermit ch2.) Through Three Sisters lowpass, manually played. Replika VST. The "clunk" noises: I don't know. I may have bumped something with my hand, but there were no microphones or spring reverbs or the like connected. It may have been extraneous and accidental, or just one of many weird Synchrodyne quirks. But I decided to keep it. Voice 2: Bastl Kastle drone through Warps Parasite delay. There's some modulation from Tides and from the Mini Slew envelope, but mostly it's self-patched mayhem. Voice 3: (the chirpy addons to voice 1) The Synchrodyne's Influence input -- which, yes, does actually emit signals for some reason -- through manually played Sputnik LPG. EchoMelt, Valhalla Vintage Verb and lots of dynamics processing to keep it in line. Voice 4: The Kastle drone through Rings with negative pitch input, through the Warps delay. (MP3) (YouTube) 2:48 Nicely noisy nerdy noodling, neural-network-named. 'Nough Ns now. Voice 1a: Microbrute triangle, with Kermit modulating its filter. Kermit is tuned a few octaves down but one of the harmonics in the wavetable is at the Microbrute's pitch. Echomelt VST. Voice 1b: Sometimes when the Microbrute isn't playing, Kermit is separately running through a VCA, very softly. Voice 2: Serum through MCharacter and ValhallaRoom. There are some software synths where I really enjoy the sound design process and nearly always create my own sounds from scratch, and Serum is one of those. Voice 3: Tides with some self-modulation, through Sputnik LPG. One send is through Waldorf D-Pole VST as lowpass and sample rate reduction; another through WOW2 as highpass. Voice 4: Rings in inharmonic string mode, 2x polyphony, FMd by EON squarewaves. Through Synchrodyne, with its VCA and Influence modulated by O_C envelope. (I've been learning both the weirder and the subtler sides of Synchrodyne, and this is the latter.) Echobode VST. (MP3) (YouTube) 3:26 There are people who claim the reason they don't Serum VST is it's "too clean and perfect." I really don't get that attitude. It is quite easy, in sound design, to make clean sounds dirty (certainly compared to making dirty sounds clean). Even within the synth itself though, if you happen to use any of Serum's features at all, you can easily make it dirty about a thousand different ways. Voice 1: Synchrodyne. The filter movement is slow and low and simply follows the note frequency, and I have the folder switch engaged and "casually careful" VCA modulation to give it a bit of that "mwah" sound. It's never quite a sawtooth-and-filter subtractive sound, despite having exactly those parts, but more of a West Coast (or 0-Coast) sound. Maul and Replika VSTs. Voice 2: 0-Coast doing its thing on bass on plucks. The triangle output is shaped by Mini Slew and mixed with the 0-Coast's own shaper. DubStation VST. Voice 4: Serum, pretending a bit to be the 0-Coast. A waveshaped triangle, a little more dirt added, and an unshaped triangle mixed in, with some faux-LPG action going on from the filter and exponential envelopes. Linear folding after that for a bit more bite. Serum's own delay effect and a touch of Valhalla Room added. (MP3) (YouTube) 7:14 I celebrated National Buy A Musical Instrument Day properly, even if meant breaking my quasi-pledge to leave things alone until Knobcon. WMD Synchrodyne Expand replaces EMW Arcade Noise and a 14hp blank. Just when I felt I was starting to master the Synchrodyne, there's this beast. Here's this song's patch in all its glory, and with Modular Addict braided cables replacing the former bird's nest. Keeping it brief: Synchrodyne takes one of the world's least practical filter designs, and implements it in a brilliant way that makes it a nearly complete unique synth voice in one module -- an experimenter's playground but also a practical set of functions. With some practice you can make it really sing, or with wild knob turning you can make amazing "living" noise. SD Expand takes the concept, opens up many more inputs and outputs, and duplicates many of the functions in complimentary and more "hackable" ways. 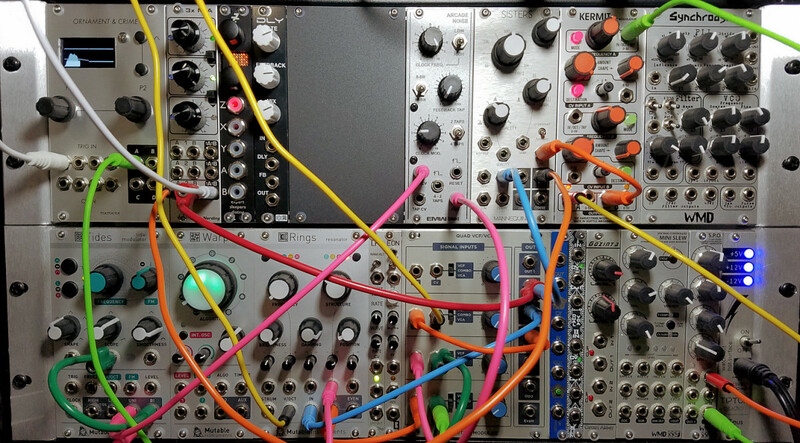 The result is mind-blowingly, nonlinearly fantastic; the two modules are nearly a system in themselves, and if I should expand to another case in the future it'll probably be "lunchbox" style with these two, a looping slope generator and a VCA because they can certainly hold their own. I spent some time the other day listening to the year's music so far, with half an ear toward choosing favorites to highlight. I wound up abandoning the idea, but it was educational -- some music is fascinating to me in the context of its creation but less so to just listen to, and some is actually the opposite. Getting lost in the noise for a few hours now and then is a fun thing to do, and I expect to do a lot of that with the Synchrodyne pair... but I hope to make my music more listenable too, without giving up the weird and challenging aspects. Voice 1: Serum sub-bass drone. Voice 2: Kermit, both channels in parallel through Sputnik LPG controlled by Mini Slew envelope. Syntorus and Ratshack Reverb VSTs. Voice 3: Rings in "Disastrous Peace" easter egg mode. Sputnik LPG and Rings brightness (organ voicing) controlled by O_C envelopes; position by 2hp LFO. MCharacter and Valhalla Plate VSTs. Voice 4: Synchrodyne & SD Expand. 4A: Osc 1 saw through wavefolder and filter 2 (clocked by PLL2) through Zlob Dual VCA. PLL2 TD signal has a looping envelope from O_C mixed with its phase delta, and PLL Desync from Osc 2's sawtooth (giving it the low growl). With mda Subsynth and UberMod VSTs. 4B: Osc1 saw through WF and filter 2 (highpass mode), clocked by PLL1 ORd with PLL2, through SD's VCA. ValhallaPlate VST. (MP3) (YouTube) 4:16 I have been playing through the Diablo 3 campaign again, and just went through the bit with the extremely talkative, only-mostly-dead Zoltan Kulle. Something about this dark (insufficiently lit? a bit dim?) ambient track reminded me of his archives and the temporary resting places of the various bits his enemies had separated him into. Anyway. This one is focused on the Synchrodyne & Expander (SD+E). There's just a single sequenced part (with a few musical variations) plus some gates to bring in additional sub-parts. Main voice: SD+E PLL2 triangle, running through the VCA and wavefolder. Horse (my own chorus plugin), Mangleverb, ET-301 VSTs. Higher harmony: Tides in PLL mode, driven by VCO2's PWM output, through DPLPG controlled by gate. Tides smoothness is envelope controlled. EchoMelt and DubStation VSTs. Lower octave: SD+E VCO1 saw, through filter2 clocked by PLL1, and then Sputnik LPG controlled by gate. VCO1 frequency is set by the same envelope as the first voice's VCA, but synced to VCO2's PWM output. Perumt8 and Replika VSTs. I expected a quantity of instability and nonlinear oddity from SD+E, so I recorded multiple takes, picked two and placed them a bit apart in stereo for maximum vibe. As it turns out, much of the weirdness happened at the same points during each take. It still made some difference though. (MP3) (YouTube) 2:31 I wrote and recorded this during some pretty intense thunder. One of these days I may have to invest in a nice mic for moments like that, because the thunder went along with it nicely. So I recommend listening to this during a thunderstorm to get the full experience. The name was, once again, mined from the infamous neural network blog. I added 12 more names to my list, just from the last couple of posts. Voice 1: 0-Coast & Synchrodyne Expand. SDE PLL2 turns the 0C's square output into a dirty triangle; 0C's slope generator, clocked by a sequence, mods SDE VCO2's PWM, which mods the 0C's balance. Through Presswerk and Frontier and two Echobode instances. Voice 2: Rings in modal mode, FMd by Kermit (with Three Sisters highpass to remove DC). Brightness and position are controlled by velocity CV. Odd and Even outputs in stereo through two Sputnik LPG channels, and Korvpressor VST. (MP3) (YouTube) 6:05 Dark ambient/drone. Two parts as is often the case, performed with 3xMIA knobs and Mini Slew Vari-Out. Astronomical, geological, meteorilogical, industrial or psychological forces? I'm going with one of the former since I actually find this sort of thing calming, at least in the sort of mood where I create it. It's definitely music to zone out to and I had to bring myself back to alertness a few times while working on it. Voice 1: Rings, with input and FM from Kermit ch2, position modulation from Mini Slew looping envelope. Kermit ch1 modulates ch2 shape. Valhalla Plate VST. Voice 2: Complex drone in Synchrodyne & Expand, where VCO syncs to Kermit ch2 and VCO1 syncs to VCO2. Space Modulator VST. (MP3) (YouTube) 2:27 When I encountered "Blucking Ding Tark" on the neural network blog as a potential 80s action figure, I knew it would make a legendary song title right up their with "Zuby Glong." It may also become my favorite fake swear phrase. Voice 1A: Synchrodyne Expand's PLL2 triangle (with VCO2 saw patched to PLL2 Desync), through parallel Sputnik VCF and VCA channels with EON envelope. Frontier, Dubstation VSTs. Kick: Three Sisters, using a O_C exponential envelope to ping the input and FM. Presswerk VST. Snare & Hat: SD+E VCO1 FMd by noise from Kermit, with SD+E VCA gated, using 4-pole out. A second gate goes to VCO1's Exp FM input to raise it from snare to hi-hat. ValhallaRoom VST. Voice 1B: SD+E's VCO2 pulse output shaped in Mini Slew, gated by Zlob Dual VCA, into SD+E In2 (so it runs through filter 1 along with the snare/hat). (MP3) (YouTube) 1:25 Electro-swing, even when made pretty much by accident like I did here, is just inherently silly somehow. Not that there's anything wrong with that. Voice 1: Rings and Synchrodyne+Expand. Rings is in Duophonic, sympathetic strings mode. V/OCT shared bewteen Rings, VCO1 and VCO2. Rings output to Filter1 in, PLL1 delta to Rings in, PLL2 triangle to Rings FM. Filter 1 in OR mode. Filter1 2P output to Sputnik LPG, and 2P Notch through attenuator to Sputnik VCA. O_C envelope controls SD VCA and both Sputnik channels. Frontier and Decimort2 VSTs. Voice 2: Microbrute with Sub modulated by Tides and PWM modulated by Kermit through Zlob Dual VCA controlled by the MB's envelope. Sidechain compression vs. kick drum. Drums: Maschine Downbeat kit, plus extra DrumSynth cymbal. Haaze and SoundBrigade VSTs. (MP3) (YouTube) 4:36 "Quintile" because it's in 5/4 time, "Hinge" because... hinges. Hingey things. Hingeness. Look, it just sounded right, which really why I do most things. Voice 1: Tides, AMing Kermit and driving its frequency in "tap" (PLL) mode, through Sputnik LPG; Valhalla Ubermod VST. Velocity and an envelope mod Tides' smoothness. Kermit is not as good at following rhythms or frequencies as Tides, though perhaps less crazy than Synchrodyne; all the gliding between notes is just Kermit's best attempt to keep up. Voice 2: Kermit, with Slope synced to square input, but slope time modulated by Contour (which is what makes it fall off by harmonics as the note decays). Slope output goes to audio input, Multiply and Overtone. LFO from Microbrute adds just a little vibrato. Frontier and EchoMelt VSTs. Voice 3: Warps sine osc, partway between wavefolder and ringmod mode. FM and channel 2 from Kermit. Warps timbre, FM amount and output LPG modulated by separate envelopes. Echobode VST. Voice 4A: Complex Synchrodyne+Expand action. VCO2 pitch is sequenced. VCO1 gets pitch from PLL2 delta and 2HP LFO, but sync from VCO2 pulse out. VCO1 saw output goes to PLL2 desync. VCO1 saw and PLL2 tri out go through filter1 2P output. Voice 4B: Just a clean square from VCO2 PWM out, through Three Sisters lowpass filter. Mixed low. Dubstation, Valhalla Vintage Verb & Valhalla Plate VSTs on Voice 4 mix. (MP3) (YouTube) 4:05 I figured it had been a little bit since I did a track really led by Rings, without altering it into something very un-Rings-like. So tonight was the night. Early in the process I had a moment of joy as the melody pieced itself together synergistically. Only about half the notes you can hear in this track were sequenced -- the rest came from patching the note's gate into Rings' FM input, causing a jump down in pitch on release. Though there is no new note triggered or played into its audio input, the sudden change does bring other bands of the exciter into play (as near as I can figure anyway). Sometimes this is a cause for annoyance when you want nice smooth sustaining notes rather than plucked sounds, but sometimes the hybrid "fluitar" or whatever is cooler than what you were intending anyway. Voice 1: A soft but noisy Kermit tone, AMd by gate-controlled fast Mini Slew cycles, filtered by Sputnik VCF. Mini Slew FM from random values (per note played on voice 2, so the random selection doesn't change in the first phrase of the song). Voice 2: Rings in monophonic Karplusverb mode (blinking red light, though I had come up with the track name more as a vague reference to recent dreams), with a gate to the FM input, Warps triangle oscillator through envelope-controlled VCA into Rings input, wobbly Tides envelope into Structure, random values per note into Position. A very light touch of chorus from SpaceModulator VST. Voice 3: Three Sisters as triple sine oscillator. Voice 1 and 3 are mixed in 3x MIA and go through ET-301 delay VST. Some reverse reverb from ValhallaPlate added in post. (MP3) (YouTube) 4:27 It really is a coincidence that the "blue" song comes after "red" -- but unlike the previous, this one does come from the neural network. It's also a coincidence that it features Rings again; I was just patching some stuff and that's where I landed. The basis of the experiment was this: I know that by running audio into the Vari CV input of Mini Slew and an envelope gate to Input, the module will act as both envelope generator and VCA with some saturation. And I know that audio-rate modulation of Tides while it's cycling much more slowly tends to create warped and weird audio. So I figured, I'd set up Tides as an envelope generator and then push audio through one of its shaping inputs. Somehow this morphed into Rings feedback and I just shrugged and went with it. Voice 1: Rings and Tides. Rings is in inharmonic string mode, monophonic; Tides in sustained envelope mode. Rings gets the V/OCT, Tides and O_C get gates. Rings Odd out goes to Tides slope; Tides Uni to Rings Position; Tides Bi is mixed with Rings Even, through VCA controlled by O_C envelope, back to Rings input. Rings Even is multed to the DAW where it gets Valhalla Vintage Verb and Replika. Basically, Tides is adding some wobbly modulation and disrupting the feedback a bit. Voice 2: Arturia Analog Lab 2 "Ligeti's Dream", WOW2 bandpass/formant filter, ET-301 delay. Voice 3: PPG Wave 2V VST & Space360 reverb. Voice 4: Microbrute, sending pitch and a pitch envelope to Kermit, which moduletes MB's filter. Ratshack Reverb & Multiply chorus VSTs. (MP3) (YouTube) 1:49 Not to be confused with a danger noodle, which is completely different. At least it is in my combined experience of cuisine and wildlife, which is admittedly a little limited. No, this is when you eat noodles, particularly with chopsticks, with sauce or soup, and are in danger of dropping some and splashing your shirt. Hazard Level ANGEL HAIR: Low risk of splashing due to low mass per noodle,and the unlikelihood of using chopsticks. Still, caution is warranted particularly when this noodle is accompanied by tomato sauce. Hazard Level LO MEIN: Moderate risk of splashing, moderate risk of staining -- your average pasta peril. Hazard Level NABEYAKI UDON: Less experienced chopstick users can have trouble with these squared strands of massive macaroni, and even lifetime noodle noshers must keep in mind that the splash zone is quite wide. But the soup itself is chemically friendlier to shirt fabric for the most part. ...where was I? Right, the new module. The 2hp Freez is a tiny module that was just released. It buffers 3 seconds of audio and can lower the bit rate to dirty it up and/or loop it with variable length; by changing the rate and/or size during playback it can also crudely shift the pitch. It's a neat little thing with many different possible uses. Voice 1: (the glitchy dot-matrix printer-ish sound) Y'know what, let me explain voice 2 first. Voice 2: (the main voice) Kermit ch2 with its waveshape modulated by ch1, through 2hp Freez and Sputnik LPG; Ubermod and ET301 VSTs. Freez is toggled on each note trigger (so it affects every other note). The rate is modulated by the note pitch so it roughly follows along, and the size is modulated by Kermit ch1 just to muck with it; the overall effect it has is to glitch things up just a little bit. Voice 1: This skips the Sputnik, and mults Freez's output into Synchrodyne VCO1 sync. VCO1 pitch follows voice 2 pitch, and its saw output goes through DPLPG on a slow-attack envelope. It's run through MTransformer VST to frequency-shift it and take away some harshness, and Replika VST for echo. Voice 3: (the bass) 0-Coast with nothing funny going on, except MWaveFolder VST to dirty up the little bit of higher frequency overtones that get through. (MP3) (YouTube) 4:58 Sometimes the only way for justice to get you is to throw industrial machinery into your wooden shoes. Synchrodyne+Expand 2P-4P output to 2hp Freez input. SD+E VCO1 pulse output to Freez trigger. SD+E PLL2 triangle to VCO1 Lin FM. Sequenced gates open VCAs patching SD+E PLL1 phase delta to Freez SR, VCO1 pulse output to Freez Size, and VCO1 Saw to VCO2 Exp FM. SD+E PLL select, PWM/PLL mode and Freez toggle/latch switches flipped manually. WOW2 filter VST opened at the beginning and closed at the end, and Barricade limiter. (I nearly always use Barricade, and rarely mention it). (MP3) (YouTube) 5:25 Listening to this afterwards, it makes me think of elephants in a rainforest. I could pretend that I had that in mind in the first place, but that wouldn't be honest. But you could pretend. Anyway now I've planted the idea, maybe it'll give you the same feeling... even though "Ostarossa" (another neural network name) sounds like a model of Italian sportscar. This song really is not very sportscar-like or Italian, is it? Voice 1: Instruments from the Maschine Rising Crescent "Cyclades" kit, edited, and sequenced played partially in a granular way (very rapid triggering). Voice 2: A drone created in Synchrodyne Expand + Kermit, gated through Sputnik LPG. (There's not much sense in fully describing the patch.) Valhalla Ubermod VST. Voice 3: 0-Coast with the slope sync patch, but also eith slope EOC patched to its FM. Slope output runs through 2hp Freez for bit reduction before going back to 0C audio input. Through Three Sisters modulated by the 0C Contour, and Echobode and Valhalla Vintage Verb VSTs. (MP3) (YouTube) 4:02 My self-criticism of this track is that it needs a bit more space. Not reverb, just more rests. It actually *does* have a bit but that was before I messed with some of the envelope times and effects. It sounded more full but I probably should have spread out the composition a bit to keep that air in there. I didn't really realize this until I was converting formats to prepare for upload, and had already unpatched the synth. But I think it works anyway and have no regrets. The heart of this artichoke... er, patch: Warps sine osc and ring modulation, paired with Tides. O_C envelope controls Tides level/shape. Tides Uni to Warps phase mod, Bi into Warps ch2. Voice 1: Core through Sputnik VCF (controlled by O_C envelope) through Synchrodyne filter 1 (lowpass, 2-pole) and filter 2 to separate stereo channels. ValhallaPlate VST. Voice 2: Core through DPLPG and Freez. One sequenced gate engages Freez trigger and lowers sample rate; another increases Freez size. ValhallaPlate and Permut8 VSTs. (MP3) (YouTube) 6:47 Thanks to trying to answer someone's question on a forum thread, I was playing around with using Disting's delay as a chorus. I stumbled on a nice retro "string machine" sort of sound using Tides that only got better when I dirtied it up with Freez and Synchrodyne and slapped on a huge reverb. It may be my new record for number of patch cables used in a single voice. Voice 1: Tides, with an FX send through Freez to reduce the sample rate (controlled by pitch CV). Through Disting VC delay line, modulated by Kermit LFO and an envelope to create a chorus effect. Disting output A (100% wet delay) runs through Synchrodyne 2-pole bandpass filter (freq also controlled by pitch CV); mixed with Disting output B (50% wet/dry chorus mix) in Zlob Dual VCA. Tides slope & VCA CV from O_C envelopes. ValhallaRoom VST. Voice 2: White noise from Warps through Three Sisters all channels, with Q modulated by Kermit noise. Valhalla UberMod VST. Voice 3: ArcSyn VST, no additional FX. (MP3) (YouTube) 2:34 When we went to dinner tonight there was an odd blue spiky rubbery thing sitting in the parking lot, looking like some kind of forlorn and dusty sea creature. I'm being so good not posting any puns about it y'all. 1B: ...through DFX Transverb VST. Some PSP PianoVerb added to sections of voice 1 in post. Voice 2: 0-Coast through JCM900, mda SubSynth and AudioThing Speaker VSTs, in parallel with Microbrute through Thrillseeker VST. Voice 3: Noise pad in ArcSyn VST. (MP3) (YouTube) 4:07 As I was working on this one I saved the project file as "untitled drone thing"; between that and the initials of Ultra Analog VA-2 the title seemed like an obvious choice. Voice 1: A complex Synchrodyne+Expand voice modulated by (semi-synced) Kermit, 2hp LFO, Freez and the Low-Rents app (Lorenz attractor) in Ornament & Crime. Through Sputnik LPG with the gate attenuated for some lowpass filtering. SerumFX, ValhallaPlate. Voice 2: Ultra Analog VA-2 in unison with 0-Coast through Dubstation. 0-Coast has a touch of FM from Tides in LFO mode reset by the sequencer clock. Voice 3: FM8 through EchoMelt. (MP3) (YouTube) 5:34 A few nights ago my spouse woke extra early, thought about staying up but decided "every inch of sleep" was necessary. And then was amused by measuring sleep, and time in general, in inches. I'm amused too. Certainly my own dreams lately have been weird enough that minutes and second are probably not the right unit. Any time there's this particular sort of groaning sound in my music it's probably a slope generator being fed triggers faster than its rise time can handle. I recognize the same technique in others' music as well. I decided for this one I'd just hook two of them together to feed each other, with outside influence to stop it from being static. Mini Slew EOC triggers 0C Slope; 0C EOC triggers Mini Slew. Mini Slew shape modulated by Kermit LFO; 0C time modulated by 0C square oscillator; 0C osc frequency modulated by a slow Tides cycle. Mini Slew output recorded through Valhalla Room. MTransformer and ValhallaPlate in post for an ultra-processed version that was crossfaded out to create the beginning transition. (MP3) (YouTube) 3:07 Voice 1: Kermit ch1 FMing Warps sine osc, Kermit ch2 into Warps ch2. Kermit ch1 octave is sequenced, via Disting precision adder. O_C envelopes control FM amount and Sputnik LPG. Korvpressor and Dubstation VSTs. Voice 1B: Warps aux output through DPLPG. BX Green Screamer VST. Voice 2: 0-Coast with Rings into the Balnace input; Slope into Rings structure. Korvpressor and D-Pole VSTs. Voice 3: Layered Magnus Chord Organ samples in Kontakt, through Univibe and Valhalla Plate. Voice 4: Serum through Transient Master. (MP3) (YouTube) 9:04 The name for this was another hypothetical 80s action figure from the neural network blog. The idea came from (A) the AY-3 desktop synth I used to have which could play six squarewaves in near-unison for a lovely sound; (B) a couple of earlier tracks when my modular system was much smaller and I clocked both Peaks LFOs at audio rates from other sources, (C) experiments with signal degradation such as Alvin Lucier's "I Am Standing In A Room", and very loosely, (D) Bach chorales and (E) some of Lovesliescrushing's organ-like walls of sound. I thought: I have a few modules that can divide frequency (with different amounts and types of unreliability) and a few that can multiply frequency (ditto); why not take one source and try dividing and multiplying it in different ways, and combine the result? Turns out it's very fertile ground, with lots of possible configurations and a lot of variation possible within each, so I expect I'll come back to this on occasion. Just probably not to this degree. The octaves, chords, clusters, slides, dissonance and inharmonic weirdness came from a single source (almost) that other modules were partially successful at following. Later on I do have a very busy Microbrute pad join in, and then something massive from Massive. Unless I'm mistaken, this is my longest track ever. It's also perhaps the first time I have ever plugged a Stackcable into another Stackcable. Voice 1D: EON squarewave into 0-Coast Slope trigger; Slope EOC into Synchrodyne PLL1 input; SD PLL1 output. (Again, dividing the squarewave unreliably, and multiplying it unreliably. Voice 1E: Warps squarewave (slight cheat?) at a lower octave than EON, into Synchrodyne PLL2 input; PLL2 through Sputnik LPG ch3, centered. 1A & 1B are mixed into Sputnik LPG ch1 and panned slightly left. 1C & 1D are mixed into Sputnik LPG ch2 and panned slightly right. 1E runs through Sputnik LPG ch3 and is centered. All 5 go through ValhallaPlate. Voice 2: Microbrute, with Metal modulated by Tides Bi output through VCA controlled by O_C looping envelope and filter frequency modulated by Kermit ch2. EchoMelt VST. Voice 3: Massive VST through ValhallaRoom. It's been a while since I've used Massive, mostly because Serum has mostly replaced it for me, being easier to use and more robust in some ways -- but Massive still has a few tricks Serum doesn't, and I expect I'll be playing with it a bit more in the future. (MP3) (YouTube) 3:08 I had this name listed among favorites from the neural network blog, but can't find it there now. Perhaps I changed the spelling accidentally, or not-so-accidentally. Anyway, picture something leopard-like that's not quite a leopard, in a setting that's Earth-like but not quite Earth, probably dozing away in the dappled shade from not-quite-familiar trees, on a hot afternoon. That's what I did. Voice 1A: Tides Parasite Two Bumps. Width is modulated by an envelope, and the permutated (Uni) output self-modulates bump 2. Main output through Freez with sample rate slightly lowered, and freezing engaged by inverted note gate. Through Sputnik LPG on a second envelope. Voice 1B: Two Bumps 1-bit output through Synchrodyne PLL1 and Sputnik VCF, with a third envelope. Voice 1 through Dubstation 2 and Valhalla Room. Voice 3: Synchrodyne PLL2 Triangle out through VCA and wavefolder, into Rings input. Rings in inharmonic strings mode, with extremely low frequency to act as a delay. Rings Position modulated by SD PWM output. Rings Odd and Even outputs through Three Sisters low and center filters, with span modulated by Kermit ch1. Vapor, Presswerk and Thrillseeker VSTs. Voice 4: PPG Wave 2V through Eos 2. Voice 5: Kermit ch2 with tremolo from EON looping envelope, through Mini Slew as envelope and VCA, and Disting C2 delay with time modulated by 2hp LFO for a chorus-like effect. Echobode VST. (MP3) (YouTube) 3:49 I was unhappy with this track when I first recorded it -- it was too long, too monotonous and too plain. So I deleted the sequence and messed with the patch and *really* didn't like where I took it from there. So I went back to the first recording, cut it down some, brought some details out of the spectrum that had been too subtle before, and it's not too bad now. I named it before I wound it became an example of Plan C.
Patch notes are from memory: Kastle FMing Warps sine osc in comparator mode, then through DPLPG. Kastle had some pitch and timbre modulation that was nowhere near to following the note pitch, and went through a VCA under envelope control. Warps output went through an LPG and into the DAW. It also went through Three Sisters highpass, Freez sample rate reduction modulated by the note pitch, and Disting lowpass and into the DAW. I had one of the Valhalla reverbs along with DubStation 2. The second voice was Massive and a reverb. (MP3) (YouTube) 3:25 Woke up way too early. Cleaned up a mess the dogs made. Couldn't get back to sleep. Made music. Almost didn't use hardware. It's kind of good that I did this, since I expect to be installing a new audio interface this evening and might not have time to work on a track. I'm going from an NI Komplete Audio 6 to a Focusrite Saffire Pro 40; it should give me somewhat better performance as well as several more inputs and outputs, and in a better form factor without the need for an SPDIF converter, DI box and awkward driver fiddling. The name is a car model from the neural network name blog. I'm picturing a design ripped off from two or three luxury sports cars that don't quite fit together, the build quality is shoddy and lots of little things are just wrong. The windows all slide down a quarter inch when you start the car. The left and right turn signals blink at different rates. The car interior is gray "leather" but the floor mats that came with it are beige. The font in the "Defruti" logo is one of those Windows Unicode fonts intended for some other language where the Latin characters are weirdly proportioned and poorly kerned, and "X05m" is Comic Sans. The word "manual" is mispelled on the cover of the owner's manual. On the gearshift, neutral is marked with an "M," and putting the car in reverse resets the radio to 880 AM. 136 Jun 16 Who Are THEY? (MP3) (YouTube) 3:02 "THEY are the dark armies -- the dark, murdering armies of PCIe. In the barren deserts of hard-to-find cables and legacy drivers, in the oceans of IRQ conflicts, courage, strength and youth are sacrificed -- sacrificed to barbarians whose only honor is atrocity. But even as we grasp at victory, there is a cancer, an evil tumor, growing, spreading in our midst. Shout. Shout! SHOUT OUT HIS NAME!" Well, it's not that bad. But I've encountered difficulties with the FireWire adapter needed to get the Saffire Pro 40 working, and am temporarily in audio interface limbo. I have my Komplete Audio 6 connected but just a pair of headphones plugged in, since I don't want to re-re-rewire everything and will hopefully get this straightened out tomorrow when a new cable arrives, or soon after when a more compatible adapter arrives. Drums: Tremor, through Presswerk, Permut8, Charlie Bucket (my own oddball distortion), MTransformer, G8 Gate, Wow2, TB Equalizer, ValhallaPlate. More percussion/noises: Ephemere, ValhallaPlate, Dubstation 2. (MP3) (YouTube) 4:08 My FireWire trouble is fixed, mostly, with a cable and my computer's onboard FW port. I can't get the lowest latency out of it, but I do have another adapter card coming that may help. At any rate, everything is up and running again, with less junk in the loop, less driver fiddling, more control and more potential for expansion. Voice 1: 0-Coast, with slope sync dirtying things via FM and the Balance input, with ET-301 delay VST. Voice 2: Rings, FMd by a sine from Three Sisters. Synchrodyne Expand PLL Triangle output acts as an LFO to modulate Position. ValhallaRoom. Voice 3: NI Una Corda. Voice 4: Microbrute, with a plucky imitation of a typical 0-Coast patch, thanks to overdriving the triangle wave and some help from a Mini Slew exponential envelope into the filter. Replika and Dubstation 2 delays. (MP3) (YouTube) 2:39 Nobody knows what it does, and you probably shouldn't activate it except in desperation. Voice 2: A complex Synchrodyne & Expand patch which self-syncs, mixes VCO2's PWM with VCO1's sawtooth and plays havoc with Filter1's clock. Envelope controls PLL1 influence; rhythmic clocks feed the PLL external clock mix and PLL2 desync. 4-pole output through Zlob dual VCA into Valhalla Plate. Voice 3: Rings, monophonic modal mode, with input from SD+E VCO2 saw through gated VCA mixed with Rings feedback. SpaceModulator and Multiply VSTs. (MP3) (YouTube) 2:53 Granular convection is the movement of particles in a mix, particularly the tendency for the smallest bits to work their way to the bottom and the largest to sit on top. It's also called the Brazil Nut Effect or the Muesli Effect. It seemd like it fit this track, even though I'm not using granular synthesis. Voice 1A: Rings in FM mode modulates Tides Smoothness and Slope with its modulator and carrier outputs respectively; Tides Bi output through Sputnik VCF and ValhallaPlate. Voice 1B: Rings modulator output through Warps vocoder. Voice 2: 0-Coast through Vapor, Space Modulator, Megaphone and TB Equalizer. Kick drum 1A: Kermit with shape set to a noisy sine, through Sputnik VCF. Kick drum 1B: The above, saturated all to heck through Presswerk and tamed a little with Barricade. Kick 2 & Snare: Maschine "Bridge Is Over" kit. Voice 3: Synchrodyne & Expand: VCO1 saw + PLL2 triangle through Mini Slew envelope/VCA; VCO2 pulse through DPLPG. Dramatic reverb drum: Maschine Drumsynth, Maximizer, dblueClipper, Metaverb, Barricade. (MP3) (YouTube) 3:40 This one is a bit rude with distortion and sound mangling. It's also a bit rude with technical problems, since my computer turned itself off without warning while I was documenting the patch and starting to do post-production. Hopefully that new Firewire card isn't the culprit and I just had the power cable loose when I put things back together. Voice 1: both Kermit channels doing unison sawtooth, mixed, through Sputnik LPG and Three Sisters low/center channels in formant mode. Sisters frequency/span were modulated by a quantized LFO and a pair of envelopes. Echomelt and Ohmicide VSTs. Voice 2: Korg Legacy Collection Mono/Poly, through WOW2 highpass filter. Voice 3: 0-Coast, with Synchrodyne & Expand VCO1 sawtooth and PLL2 triangle into its input. Two effects sends with Chipcrusher instances doing somewhat different things, and all of it through one of the Valhalla reverbs. Voice 4: Waverazor, through WOW2 lowpass filter on an envelope follower to sort of act LPG-ish, and a Valhalla reverb. My memory on this seems to be pretty good after all. (MP3) (YouTube) 2:54 I thought of this track title back in 2016 and I've been waiting for the opportune moment to use it. Drums: Uppercussion BitKits through MWaveFolder and DubStation 2. Voice 1: Tides Parasite in Two Bumps mode, FM'd by a Perpetual Spring Device with a desk fan sitting on it, through an envelope, plus a DC offset for a little inharmonicity. Bumps/Potholes randomized on note trigger; Permuted Harmonics output through Sputnik LPG, then Freez. One sequenced gate allows the Tides sub octave through the LPG as well, and another triggers the Freez. Valhalla Room. Voice 2: Kermit FMing Warps sine, with mild wavefolding. Mini Slew envelope mixed with the gate controls FM index and Sputnik LPG. Transient Master, Valhalla Room and Korvpressor. (MP3) (YouTube) 3:14 My goal here was "do something ambient and non-obvious with Freez", but I kind of went overboard with the patching. At the same time, I managed to make Rings sound not a thing like Rings -- not just not unlike the string/mallet basic Rings sound, but unlike the other types of sounds I typically get out of Rings. Voice 1: Microbrute, with filter FM from Synchrodyne Expand PWM out. TB Equalizer & Valhalla Vintage Verb. Voice 2: Rings in Karplusverb mode, with input from Kermit through 0-Coast contour/dynamics (because I managed to run out of envelopes otherwise). I'm currently having a strange but cool issue with Kermit where channel 2, using some waveforms, picks up some interference from channel 1's clock, and I'm taking advantage of that as well as using channel 1 to modulate channel 2's waveform. Valhalla Vintage Verb. Voice 3A: Tides modulated by EON (oscillator mode) and Synchrodyne at harmonically related frequencies. EON is patched into Tides Freeze input for a quasi-sync effect. O_C envelopes control Tides smoothness and level. Slope is FM'd by Synchrodyne PLL2 Triangle. Voice 3B: EON is multed to Three Sisters lowpass. Sisters is FM'd by Tides Uni output, and its Q is modulated by Synchrodyne's PWM saw output. Voice 3AB mix: 3A (with a little overdrive) and 3B (with level control from O_C envelope) into Warps inputs. Crossfading managed by another O_C envelope. Into ValhallaPlate, WOW2 and SerumFX VSTs. Voice 3C: Warps output is multed into Freez. A slow LFO gently modulates the size, and the inverse of voice 3's gate triggers the repeat effect. Through Sputnik LPG controlled by Mini Slew envelope, into MTransformer and Dubstation 2 VSTs. (MP3) (YouTube) 3:09 I'm not sure what a triframe is. It could be a type of sailing vessel, bicycle, drum, eyeglass design or any number of other things. But based on the sounds here it may be the antenna on a radio device monitoring the atmosphere -- receiving the natural sferics caused by lightning discharges, as well as mysterious signals from manmade or perhaps alien devices. Whistles, pops, etc. : Mini Slew, Synchrodyne, Sputnik LPG, Freez and Zlob Dual VCA. - EOC through Synchrodyne PLL back into Mini-Slew FM (this makes the delay and decay times follow a complex generative pattern). - LPG output into Freez. Voices 1 & 2: An ArcSyn patch, and a variation on it (with ValhallaPlate). ThrillSeeker and Barricade on the master, and more dynamics and EQ work in post. (MP3) (YouTube) 3:03 Lots of thoughts lately about my evolving musical style(s), what constitutes core techniques and gear in that context, and what the core/experimental balance should be. In some sense I think that might be a false dichotomy. I'm doing some of each in this track, as I do in most. Also some thoughts from/about a musician with whom I have much mutual disagreement. He doesn't enjoy the process and would rather just push a button and have a song come out. I find that astonishing and just sort of... broken. I care about the result, but the process is important, fun, thereapeutic, perhaps spiritual. It's a positive feedback loop of inspiration. One might be able to argue (pointlessly) whether what I do is art or "crafts" (*), but the sure thing is I'm not focused on making *products*. One other thing he said (aside from missing several points) is he calls his work "songs" rather than "tracks" as if my term was somehow disparaging. I chose it sometime back because my works have no lyrics and some have no melody, or the melody is a sort of illusion emerging from the sound design, so I'm not sure they are "songs" as such. Then again, we refer to bird and whale "song" too, so it might not be that inappropriate a term after all. Voice 1: Tides. Bi output through Zlob Dual VCA, saturated in Gozinta. One envelope for VCA CV and Tides Shape. Voice 2: (unison with 1 throughout most of the song) Synchrodyne+Expand VCO1 square through Olegtron 4060 for disruption, then into PLL1 for filter control. VCO1 square converted to triangle by PLL2; tri and VCO2 saw through filter 1. Wavefolder and 2-pole outputs into Warps channels 1 and 2; Warps algorithm modulated by VCO2 saw, timbre by O_C envelope. Through Sputnik LPG. ValhallaRoom & Replika VSTs. Voice 3: 0-Coast with a bit of self-FM. Two Dubstation 2 instances. Voice 4: Rings in sympathetic strings mode, monophonic. Even output through Freez, gated by note gate. Freez sample rate inversely modulated by EON envelope. Freez output to Rings in for feedback. Rings odd output through Mini Slew (as envelope/VCA) mixed with Freez output through DPLPG. ValhallaPlate. (*) My thought here is that it's probably art. In a craft, one uses mechanical/practical skill to create an outcome of a specific, practical and/or decorative form, with limitations on expression and a certain duplicatibility. Art, on the other hand, is less structured, more evocative and expressive than decorative or practical, and less about perfection of form than aesthetics and emotional effect (mechanical skill enables that expression, rather than being the focus). The entire thing is a gray area of course, but I would say that producing dance music is much more craft than art, and what I do is much more art than craft. It may seem technical, and it's certainly geeky, but there's a whole lot of obsessing over mixes, balance, controlling every little detail that I simply don't do because it's not the point. I'm aware of many of the imperfections (those I don't create intentionally in the first place) and choose to leave them in place. All music is licensed under a Creative Commons Attribution-NonCommercial-ShareAlike 3.0 Unported License.